According to Pevsner (p.24) Ratcliffe possesses the single largest collection of surviving alabaster carvings in the county - eleven slabs, dating from c.1490 - 1524. Although they are in bad condition. Ratcliffe is also one of the places in Nottinghamshire where alabaster was quarried. In his 'General View of the Agriculture of the County of Nottingham' Robert Lowe notes "Red Hill, at the junction of [the rivers] Trent and Soar is a fine plaster quarry, from which Mr. Pelham, now Lord Yarborough, had columns of 20ft high, in three pieces, used in his Mausoleum"
George Fellows* notes that Lord Scarsdale also used the same Ratcliffe quarry for his columns at Kedleston Hall near Derby, and that the enormous tomb of Henry Sacheverell (1625) at Ratcliffe (it is presumed) is also made from alabaster sourced locally in the village. 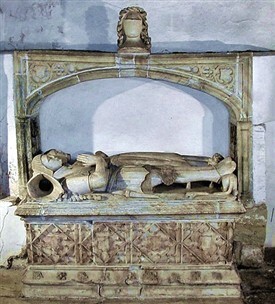 The church contains four alabaster tombs to the now extinct Sacheverell family who were once lords of the manor. 1. Sir Radulphus Scheverell. The earliest of the tombs is to Radulphus Sacheverell (d.1539) which stands under a canopy in the north aisle. Two effigies are shown - to Ralulphus and his first wife Cecelia (d.1528). The canopy is surmounted by a helmet, but no arms are depicted. It is thought likely that these were originally painted onto the base panels, but no trace of paint remains. Sir Raulphus is shown in plate armour with a skirt of mail. His face is clean sahven, and his head rests on his helmet (the crst is broken off). On his fingers are many rings, whilst his feet rest against a lion. Cecelia wears a long, loose robe, fastened by a brooch: a treble necklace with cross is delicately carved. Her hands have been broken off. This page was added by Website Administrator on 21/09/2014.